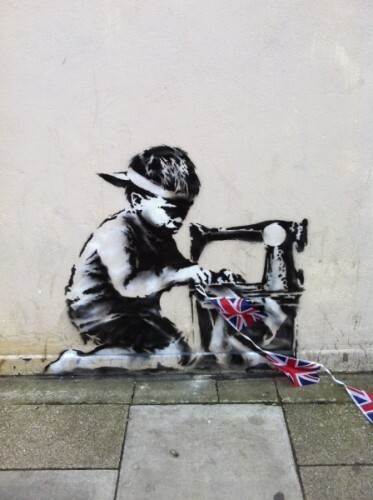 A new Banksy has appeared on the side of the Poundland store on Wood Green High Road near Turnpike Lane station in north London. This photo was taken by Luke Giles and posted by Richard McKeever on local forum Bowes and Bounds Connected while it still had its bunting attached along the wall yesterday - there's a wider angle photo here. As Richard notes, it "looks like a comment on the upcoming Jubilee celebrations, maybe a reference to the London 2012 Olympics - and its siting in Wood Green High Road may have a resonance with the street disturbances and looting of last summer." What do you think? How long the bunting will linger or the piece survive undefaced or un-perspexed remains to be seen. Browse our Banksy archive for more.